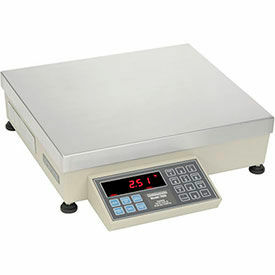 Electronic Counting Scales for industrial weighing and counting applications. Allow for fast repetitive weighing tasks with backlit LED/LCD displays for ease of use. Most models feature AC power and internal rechargeable battery as well as RS-232 connectivity. 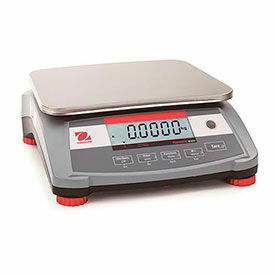 Compact Digital Counting Scales Help Build Productivity By Producing Accurate Weight Measurements And Results. 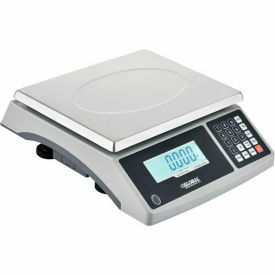 Compact Digital Counting Scales are constructed with a cast aluminum frame, a plastic housing and a stainless steel pan for long lasting durability and dependability. Compact Bench Counting Scales provide sampling function, preset tare and average piece weight with low weight alert, positive and negative counting, cumulative weight totals, and easy portability. Includes removable pan. Trooper Count scales offer multiple counting modes and 300 memory locations to store part numbers, tare weights, average piece weights, accumulations and hi/lo points for up to 60 items. Ranger scale provides large, backlit LCD display with fast display of weighing results within 2 seconds, as well as RS232 port for quick connectivity to printers and systems. Available types are Compact Digital Counting Scale, Compact Counting Scale, Compact Counting Scale With Thermal Printer and Counting Scale. Weight capacities are 6 lbs, 13 lbs, 15 lbs, 26 lbs, 30 lbs, 60 lbs, 66 lbs and 133 lbs. Color is Gray. Sizes vary per type. 1 Year Limited Warranty. 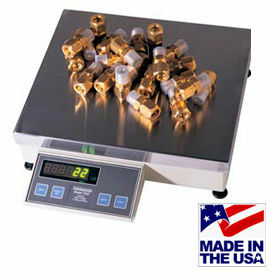 Pennsylvania Series 7600 Heavy Duty Counting Scales Are Designed For Advanced Counting And Weighing Applications. Pennsylvania Series 7600 Heavy Duty Counting Scales are HD/High resolution counting scales made of die cast aluminum and stainless steel for long lasting durability and consistent performance. Average piece weight, tare weight, any sample quantity, ID number, time, and date output can be displayed on the LED screen and entered via keypad for simplified operation. One-button simplicity, pushbutton zero, and optional dual base input for remote Sample-to-Bulk counting available. Available types include AC/DC & DB Capable, AC/DC Capable, and DB Capable Counting Scale. Capacities are 2, 5, 10, 20, 50, 100, 150, and 200 lbs. Includes 4 Year Limited Warranty. Made in the USA. Dimensions and readabilities vary per model. Adam Equipment Washdown Scales Are Used For Food Preparation, Food Processing Plants, Agricultural Facilities And More. 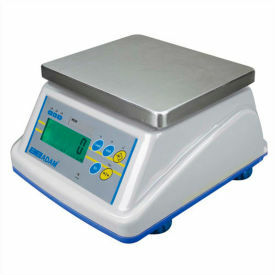 Adam Equipment Wash Down Scales are made of stainless steel and ABS plastic for long lasting durability including IP65 rated wash down housing and large stainless steel pan. Easy check weighing operation with color indicators for Under, Ok, and Over limits provides ease of use. Powerful backlit LCD with capacity tracker, overload indicators, low battery and auto power-off. Operates with included AC adaptor or rechargeable battery pack for portability. Available styles Wash Down Scale and Wash Down Retail Scale Weight capacities are 5lb, 6lb, 9lb, 15lb, 18lb, 30lb and 35lb. Pan Size is 8-1/4" x 6-3/4". Scale Size is 9-1/8" W x 10-7/16" D x 6-1/8"H. Readability varies. 2-Year Warranty. Pennsylvania Series 7500 Heavy Duty Counting Scales Are Designed For Speed And Exceptional Accuracy In Inventory Control Applications. Counting scales are made with heavy-duty cast construction for lasting durability and efficient material handling. One-button counting for easy use. Features bright LED display with two units of measure. Auto sample update. RS-232 interface allows connection to a printer. Available capacities range from 2 to 200 lbs. Readability available to 0.0002, 0.0005, 0.001, 0.002, 0.005, 0.01, and 0.02 lbs. 4 Year Limited Warranty. Made in the USA. Dimensions vary per model. Ohaus Ranger 3000 Compact Digital Counting Scale 30lb x 0.0005lb 11-13/16" x 8-7/8"